In the previous installment of this "Ark of the Covenant" series, we looked at one of the many suspect discoveries claiming the Ark found. Today, we'll look at the origins of the Ark and who it really symbolizes. The lid that covered the box was called the "mercy seat." It was made of pure gold. Two gold cherubim were mounted on the lid, one on each end. The cherubim faced each other, and their wings were spread out toward each other, overshadowing the mercy seat. The Ark was housed in the Holy of Holies, the innermost chamber of the Temple. Once a year, on the Day of Atonement, the High Priest entered that Holy of Holies and sprinkled blood on the mercy seat to atone for his sins and the sins of the nation of Israel (Leviticus 16 and Hebrews 9). Because God had promised Moses that He would commune with Israel "from above the mercy seat" (Exodus 25:22), the concept developed that the Lord of Hosts was enthroned on the cherubim of the Ark (see 1 Samuel 4:4 and Isaiah 37:16). The acacia wood symbolized our Lord's humanity. The gold overlay denoted His deity. The Ten Commandments and the Pentateuch inside the Ark pictured Jesus with the Law of God in His heart, living in perfect obedience to it. The pot of manna spoke of Jesus as the Bread of Life or our life sustainer. Aaron's rod that budded obviously prophesied the resurrection. 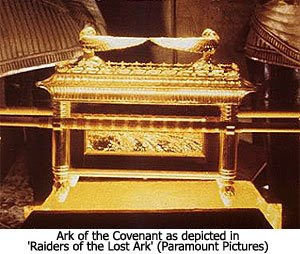 In the next installment of this series on the Ark of the Covenant, we'll be looking at its history in the Bible.